In my opinion this had one of the greatest first episodes I have ever seen. The plot is amazing and the manga is also great. I expect big things from this series and so far(even though it was only one episode) my expectations are coming true. Again loved the first episode. What started off as a one-shot manga has become a serialized manga published in none other than Weekly Shonen Jump. Yep, right along side other works as Naruto and HunterxHunter and One Piece. Without getting too carried away with the series plot which has yet to be fully animated, the basic premise is a love story involving a promise. Raku Ichijou carries around a locket that was given to him by his first love with the intention when they meet again in the future they will marry. Flash forward 10 years and now Raku is doing his best to be model student since he doesn't want to stay in the family business (Yakuza) and dreams of one day becoming a civil servant. Out of his fellow classmates he has a very large crush on Kosaki Onodera, whom he's know since middle school. Then one day a mysterious transfer student arrives, albeit in a not so friendly first meeting (Knee to the face). We meet Chitoge Kirisaki a mysterious beautiful girl whom Ichijou doesn't get along with quite well because of said knee to face meeting. Even though they have a rocky first start unbeknownst to them, both their families are criminal organizations of which their both the heir too. Being that their both the heir to their respective crime families both their father's conspire to put an end to the fighting between both groups by making Raku and Chitoge become 'fake' lovers for the next 3 years. The first episode of the anime stays very true to the source material and essentially covers the first chapter in the manga. Being that the manga is just over 100 chapters at this point and being published weekly we can possibly look forward to much more developments in the characters and story. What's really wonderful about this first episode and has high hopes from me of things to come is the people behind the production of this anime. The Production Studio Shaft, best known for works on the Monogatari series and Puella Magi Madoka Magica series is animating this story as is the Director of both aforementioned series Akiyuki Shinbo is directing this show. With such talents it's easy to see inspirations of both series, especially Monogatari in this first episode. With that being said this gets a very high recommendation from me. If you're a fan of Shaft and Akiyuki Shinbo then this is a no brainer to watch this show. Even if you've never read the Manga (You'd better start) it's very easy to get into this story and not help to love it. Bottom line watch it and Enjoy! Are you a fan of Moé? Do you like old school Yakuza/Mob backgrounds? How about high school dramedy about a Boy who wants to live his own life, in a world that wants him to be someone else. This anime is a refreshing take of the high school romance genre. With bouts of lavish art interlaced with gag humor and different art styles to highlight the issue at hand. I am making this review after seeing the first episode and will defiantly be watching it more. The plot it a little straight forward for anyone who's been watching anime for the last 10 years, but for new viewers it will be a very open and wonderful treat. Looking back at other high school dramedies I can say that this one has the good mix of fun, exciting and a level of adventure. I want to say it's like a reverse Romeo and Juliette by the end of the episode without going into spoilers. I would recommend this anime to anyone looking for that *badump* of the heart moment when emotional strings get tugged just at the right moment. I can see the characters developing quite well, as the manga has been quite popular too. 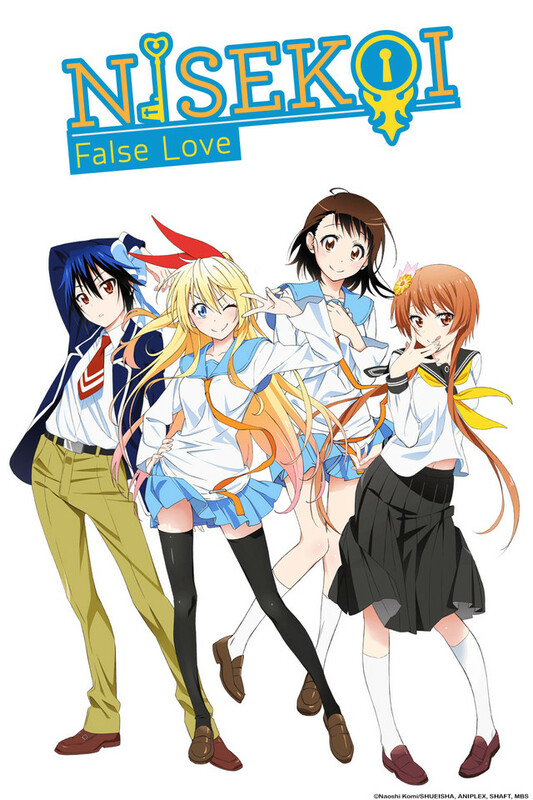 Nisekoi: False Love have a lot of hype behind it and is understandable. Is a Shaft anime - the studio behind the ultra-popular monogatari series - and is based on a popular ongoing manga. Particularly i was pretty excited with Nisekoi too. The first episode actually is not that great. I didn´t bough any of the main characters. The soundtrack was so-so and the ultra stylezed animation of Shaft did not worked with this particular series in my opinion. Still, is not a bad start and i will keep watching. I've always been a fan of the manga since it was first released, and I'm thrilled that an anime adaption is rolling out. I cannot wait to see how they animate this, they better do a good job! From the looks of the first episode, I think I'll be satisfied though. The voice acting for Raku, Chitoge, and Onondera are great. The animation could be a little nicer considering the quality of the manga drawings, but its satisfactory.. I can't wait for more! Thank you shaft! Okay that was way better than I thought. Can't beat crazy yakuza guys who act like they are your extended family doing crazy things. Beautiful girl who is totally nuts, and some awesome best friends. This is one good series. I added this on a whim and I'm glad I did. But now I'm pissed that have to wait a week in between episodes lol. This may be an episode one review, but I fell in love within the first 2 minutes, and it only got better from there. This is one of those rare shows that you can tell with absolute certainty that it's one of the brightest gems of the season. The animation is beautifully done by Shaft, who also animated one of my favorites of all time, the Bakamonogatari series. The characters are unique, interesting, and fun. And the plot seems like it'll be full of crazy gags and shenanigans that'll have us all laughing and smiling like fools all season long! I can't wait for more!!! I didn't know that this was even going to be coming to video, some crucial points that I am really excited to see on the video. This show is legitimately funny. The characters are lovable, and none of them are annoying. Even though this is a harem, it is quite obvious who the main girl will be. As far as how good the adaptation from the manga goes, it is amazing. The first episode only encompasses one chapter out of the one hundred out right now, so it could be a long series.